It's certainly surreal, the sun blazing at midnight in Lapland, home of a zillion lakes, where, buzzed on 120-proof Finnish vodka, I'm jumping in one of them, that is, after my sauna. And who's that bearded, naked man in a towel on the sauna porch? It's Francis Ford Coppola, another high-and-happy camper. Earlier, clothed, he led the gathered in off-key singing of "Avanti Popelo" and then soloed on "God Bless America." Welcome to a VIP party at this June's Midnight Sun Film Festival, where Coppola was a special guest, among four of the best directors in the world: Hungary's Miklos Jancso, Argentina's Fernando Solanas, Quebec's Denys Arcand. This was the rare private occasion that the filmmakers were whisked away from the five-day fest. Normally, they mixed with the movie crowds, and Coppola even tangoed at an open-to-everyone merriment. If blonde Finnish dance partners weren't enough, the Godfather cineaste was won over by a careful retrospective, which reclaimed such neglected works as Tucker and Gardens of Stone. A fest organizer noted, "It was pretty obvious that Coppola was happy," and he never complained being boarded in the dim, no-frills fest hotel. 16 years ago, three Helsinki-based filmmakers (Timo Malmi, Aki and Mika Kaurismaki) envisioned a utopian European festival, and they'd been at enough bad ones to realize what they didn't want. "The filmmakers use limousines, stay at five-star hotels, and the people attending never talk to them," Mika Kaurismaki told me. There was an American model: the Telluride Fest in Colorado. There, guests speak informally at seminars, mill with the movie-crazed crowds; emerging directors and veteran "auteurs" are honored equally with showings of their works. Telluride is one thing, but how to lure world-class filmmakers to Finland? "A festival in Helsinki would be too normal," Kaurismaki said. "We wanted something strange." A search ended in Lapland, a twelve-hour drive north of Helsinki, in the tiny municipality of Sodankyla, where the mayor of the town (known for alcoholism, suicides, unemployment, and coal-dark winters) was eager for business. The Kaurismakis saw possibilities in this three-street, one movie-house spot. It's geographically exotic, one hundred kilometers above the Arctic Circle. Each June, transcendance: it's tee-shirt warm and the sun shines 24 hours a day. 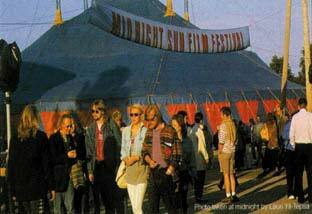 The Midnight Sun Film Festival was born in 1987. Come one, come all, to the north-by-north, Lappish polar region, where reindeer roam free, where the sun never goes away. For flown-in filmmakers: a major selection of your movies, new and old, projected round the clock. "The first festival was very improvised, but it was magical," Kaurismaki recalled. "Young, old, locals, famous, filmmakers, journalists, all on the same level, a very nice feeling, this festival in the middle of nowhere." A mammoth circus tent was raised as a second screening space, with a 35mm booth, and the fest's guests, French filmmaker Bertrand Tavernier (Round Midnight) and American "B" cult director, Sam Fuller (The Naked Kiss, Shock Corridor), were complemented with screenings of many of their films. What serendipidity! Tavernier and Fuller might be the most garrulous filmmakers ever, famous for talking everyone into exhaustion. Midnight Sun festgoers got all the conversation they could desire. "Sam never slept," said Kaurismaki. "On the street, if you saw the cigar smoke, you knew Fuller was there, talking about movies." Fuller came into the picture in 1972, when he was visited in his LA home by Finnish film critic, Peter von Bagh, the Midnight Sun's artistic director. Self-exiled in Paris in the 1980s, he readily accepted the invitation for a the first Midnight Sun Fest. "How did we find the money?" von Bagh marveled, when I interviewed him. "How in no time did we have fantastic Cinemascope prints of Fuller's House of Bamboo and China Gate? Sam immediately became great friends of the Kaurismaki brothers, appearing in Mika's film, Tigrero, and Aki's La Vie de Boheme. He was all over the place at Sodanklya, joking and clowning, a talking machine. He gave a tone to the place." Filmmaker guests since have included Michael Powell, Krzysztof Keislowski, Wim Wenders, Terry Gilliam, and I'm honored to be the third American film critic invited there, following The Village Voice's Jim Hoberman and The Chicago Reader's Jonathan Rosenbaum. Still, there was only one Sam Fuller, and, after his 1997 death, a Sodankyla street was named after him: "Samuel Fuller's Street/Samuel Fullerin Katu." Looking at the street sign, I imagined cruel February in frozen Lapland: Sam and the reindeer. Surreal.